MAKING SOYBEAN SILAGE | Chatham-Kent Agriculture Development | We Grow For the World! In 2017, wet growing conditions have made it difficult to put up high quality forages. 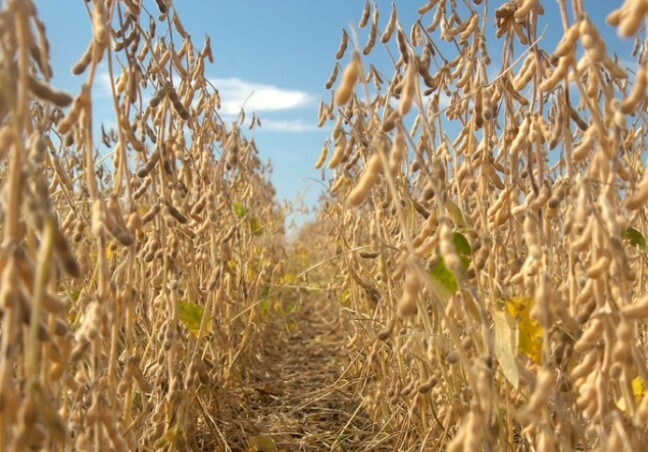 A wet spring delayed planting in many regions, and the cool summer and an early frost may prevent some soybeans from reaching their full potential as an oilseed crop. These circumstances may encourage producers to consider harvesting soybeans for silage. Before committing to making silage, check the labels on all crop protection products that have been used on the soybeans. Some will list a pre-harvest interval (PHI) for silage. Other products will clearly state that the formula is not safe for use on feed, forage, or silage. There will be products that do not mention silage or feed on the label. These have not been tested for their effects on livestock, and crops treated with them should not be fed. Once it has been determined whether the soybeans could be safely fed, the next step is to clear the change of purpose on insured acres with Agricorp (1-888-247-4999). Soybeans can be ensiled right up to the R7 stage (full maturity), but highest feed quality is usually achieved at R3 (beginning pod) or R4 (full pod). Plants need to be wilted down to 60-65% moisture. Use of a roller-conditioner may speed drying time while minimizing losses. Soybeans have more buffer capacity than corn, and their low sugar/high oil content can make proper fermentation a challenge. Silage inoculants and added sugar – as grain corn or molasses – can increase the odds of success. Another strategy is to make soybean-corn silage by mixing the two crops in a 2:1 ratio before packing into the silo. The sugars and starches in the corn can help overcome the buffering tendencies of the soybeans. The nutritional value of soybean is comparable to early bloom alfalfa, and this remains consistent as the plant matures although how it feeds out varies. As the oil content of the beans increases with maturity, later harvested plants may have lower fibre digestibility and reduced intakes. Soybean silage is often most palatable as no more than 50% of the ration (dry matter basis). Soybeans were first introduced to Ontario as a forage crop, and are routinely used in some northeastern states as part of dairy rations. With a bit of planning, soybean silage can be used to increase the amount of quality forage available. Brown, C., and Bohner, H. 2012. Soybeans as a forage crop. Manitoba Agriculture. Date Unknown.Ensiling Soybeans. Undersander, D., Jarek, K., Anderson, T., Schneider, N., and Milligan, L. 2007. A guide to making soybean silage.